Basic electrical symbols like earth electrode, cell, battery, source, ideal source, resister, variable resister, pre-set resister, attenuator, capacitor, antenna, diode LED, crystal are included here. Cell is a device containing electrodes immersed in an electrolyte, used for generating current or for electrolysis. Battery is a container consisting of one or more cells, in which chemical energy is converted into electricity and used as a source of power. Source is a part of a field-effect transistor from which carriers flow into the inter-electrode channel. Ideal source includes ideal voltage source and ideal current source. An ideal source is a theoretical concept of an electric current or voltage supply (such as a battery) that has no losses and is a perfect voltage or current supply. Ideal sources are used for analytical purposes only since they cannot occur in nature. Resistor is a device having resistance to the passage of an electric current. Capacitor is a device used to store an electric charge, consisting of one or more pairs of conductors separated by an insulator. Antenna is an electrical device which converts electric power into radio waves, and vice versa. Let we take a look at how to use the basic electrical symbols to provide a schematic diagram of the circuit and its components.Example one: three D-cells are placed in a battery pack to power a circuit containing three light bulbs. Each light bulb is represented by its own individual resistor symbol. Straight lines have been used to connect the two terminals of the battery to the resistors and the resistors to each other. 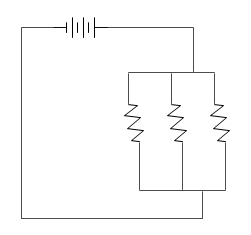 First, choose the electrical symbols you might use in the diagram, in this example is battery, resistor. Then, use the connectortool to connect these symbols. Therefore, the final diagram can be like the following picture. The picture below shows switches symbols. 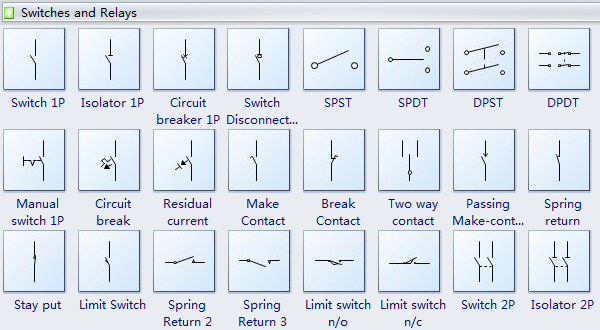 Switch 1P, isolator 1P, circuit breaker 1P, SPST, SPDT, DPST, DPDT and more symbols are available here. Switch is a device for making and breaking the connection in an electric circuit. Isolator is a mechanical switch which isolates a part of circuit from system as when required. Electrical isolators separate a part of the system from rest for safe maintenance works. SPST is a single-pole, single-throw (SPST) switch. SPDT is single-pole, double-throw (SPDT) switch. DPST is double-pole, single-throw(DPDT) switch. DPDT is a double-pole, double-throw (DPDT) switch. As you can see from the above pictures, using electrical symbols to draw electrical circuit diagram is quite easy. 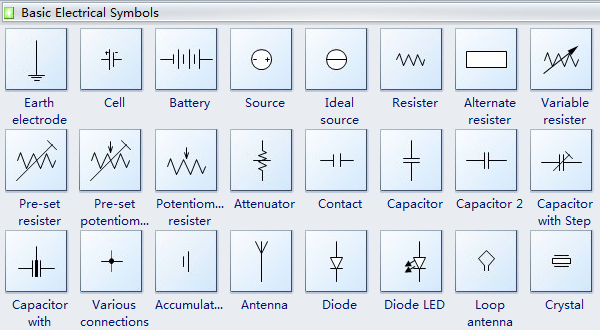 To illustrate the method, we will give you another example about using the basic electrical symbols. Example two: Three D-cells are placed in a battery pack to power a circuit containing three light bulbs. First things first, quickly figure out what electrical symbols shall be used in the diagram. Then think about the layout of these symbols. Last but not least, use connector tool to connect all the electrical symbols. Therefore, the final diagram can be like the following picture. From the above examples, we can conclude that, simple words can not clearly describe a specific electrical circuit. Using the basic electrical symbols to draw a circuit diagram can show the manners in which the circuit components are placed. 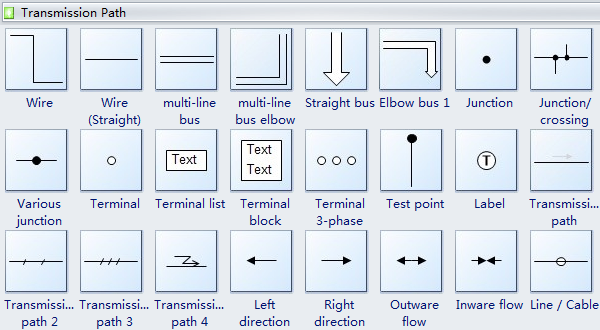 The picture below shows transmission path symbols like wire, multi-line bus, straight bus, junction, terminal, test point, label, outware flow, inware flow, etc. 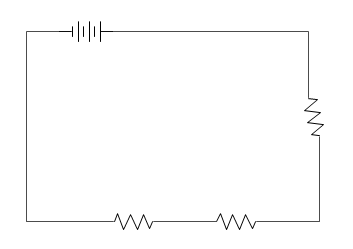 Wire is used to connect the components in a circuit. Test point is a location within an electronic circuit that is used to either monitor the state of the circuitry or to inject test signals. Outward flow means flowing outwardly, so inward flow means flowing inwardly.